According to the Buddhist Trikaya doctrine, Vairocana (also Vairochana or Mahavairocana; 大日如來 or 毘盧遮那佛 Chinese: Dàrì Rúlái or Biluzhenafo, Japanese: Dainichi Nyorai) is a Buddha who is the embodiment of Dharmakaya, and which therefore can be seen as the universal aspect of the historical Gautama Buddha. In the conception of the Five Wisdom Buddhas, Vairocana is at the center. 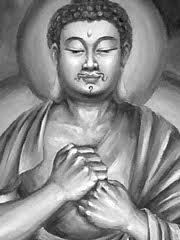 Vairocana is the central figure in the esoteric Shingon Buddhism in Japan, which is based largely on the teachings of the Mahavairocana Sutra. The Vairocana statue in Nara’s Todaiji is the largest bronze image of Vairocana Buddha in the world. The larger of the monumental statues that were destroyed at Bamiyan in Afghanistan was a depiction of Vairocana. In the Rigveda the word ‘vairocana’ has the connotation of a brilliant and luminous sun. Indeed, Vairocana in Tibetan is called ‘Namnang’, meaning ‘the illuminator’. Vairocana displays the Dharmachakra mudra. Dharmachakra in Sanskrit means the ‘Wheel of Dharma‘. This mudra symbolizes one of the most important moments in the historical life of the Buddha, the occasion when he preached to his companions the first sermon after his Enlightenment in the Deer Park at Sarnath. It thus denotes the setting into motion of the Wheel of the teaching of the Dharma. Vairocana is an idealization of this central function of the Buddha as a teacher, without which there would have been no Buddhism, and no path to enlightenment. Indeed, his lotus seat is supported by a pair of two great lions. The lion is the king of beasts and when he roars all others fall silent. Similar is the roar of Buddha’s teachings, in relation to the grandeur of which all other voices of our everyday life become insignificant and fall silent. Not surprisingly, meditating on the image of Vairocana is specifically believed to transform the delusion of ignorance into the wisdom preached by the Dharma. When Gautama Buddha turned the wheel of the Dharma, it illuminated (like a sun), the hearts of men and women darkened by ignorance. Vairocana’s distinguishing emblem is the golden or solar wheel.